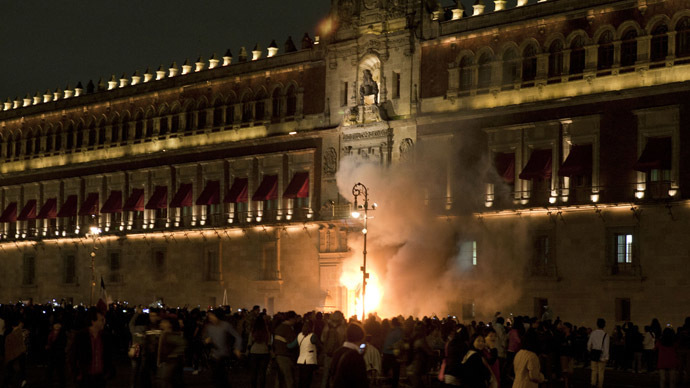 A group of protesters in Mexico City have tried to break into the National Palace and have set its front doors on fire in response to government's alleged role in the abduction and murder of 43 students who went missing in September. The rally’s participants used a metal police barricade as a battering ram, trying to storm the National Palace in Mexico City, which is mostly used for ceremonies involving President Enrique Pena Nieto. 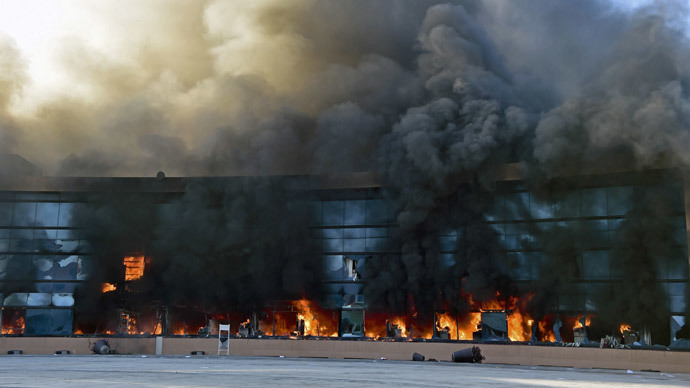 Having failed to break into the National Palace, protesters set its front doors on fire. They managed to damage the entrance to the building, but were unable to get inside and were eventually driven away by police. As the demonstrators were trying to forcefully break into the National Palace, another large crowd was protesting in front of the attorney general's office. There have been reports of injuries and arrests, as police dispersed the raging crowds in Mexico City. The storming of the National Palace came as the climax of Saturday’s mass rally which was inspired by Attorney General Jesus Murillo Karam’s revelation Friday that three Guerreros Unidos gang members in custody had confessed to killing the students and incinerating their bodies, and had claimed that the young men were handed over to them by the police. Infuriated by alleged police involvement in the abduction of students, hundreds of protesters on Saturday set cars on fire, painted graffiti and threw rocks at government offices. “We are asking the same thing as usual. 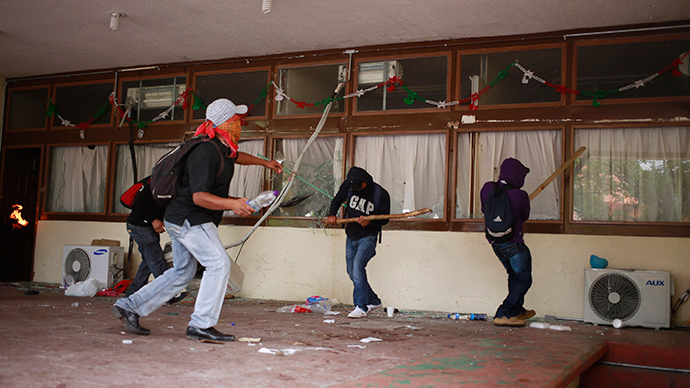 We want to see our comrades alive,” a masked student told AFP as others chanted, "They took them alive, we want them back alive.” The students went missing on September 26, when they clashed with police during a protest in the southwestern town of Iguala. After police detained them and took them away, the students were not seen again. Protesters wearing masks outside the Guerrero state building in Chilpancingo tossed firebombs and torched around a dozen vehicles, including trucks and a federal police vehicle. 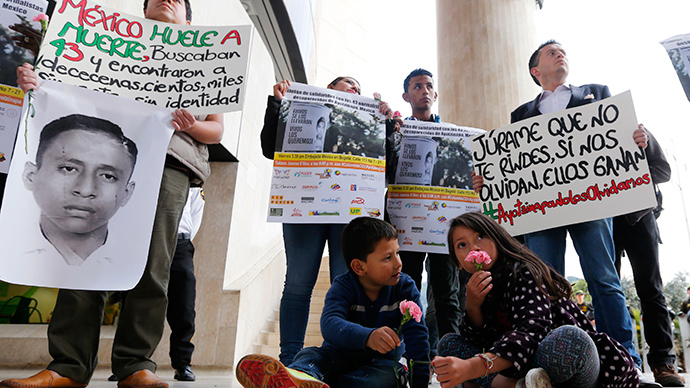 Besides the allegations that the students were led to their eventual deaths by law enforcement agents, Mexicans were furious with the Attorney General's remarks during the press conference. After an hour of fielding questions, Jesus Murillo Karam abruptly signaled for an end to the press conference by turning away from reporters and saying, “Ya me canse” or "I've had enough." In taped confessions, gang members said they took students to a landfill in the town of Cocula aboard two trucks, where they killed them and spent 14 hours burning their bodies and belongings. 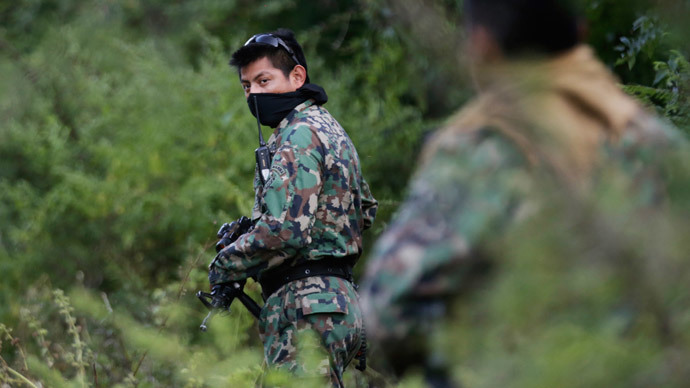 In connection with the massacre, authorities said they have already arrested 74 people, including the ousted mayor, Jose Luis Abarca, his wife Maria de los Angeles Pineda, 36 police officers and several Guerreros Unidos gang members.